73 S T A R T H E R E 2 0 1 8 machine? Are they local to your business? If not, what costs are required to get a tech on site and what is the average wait for service? Ask yourself, when you are down, how difficult and costly will it be to get running again? When multiple machines are affordable and suit your production needs, it's the one which will be able to be operated, maintained, and repaired at the lowest cost and with the least difficulty that serves you best over time. Effective Accessories Though there is a world of equipment to expand your shop's capabilities, certain accessories and tools are critical in your initial setup. Toolkit: Make sure that you have a dedicated toolkit for fixes, needle changing, and any necessary lubricants or anything else that the machine requires. It should always be within reach of the machine. Hoops: You must ensure you have sizes to address the most common decoration areas: chest logos and full backs. Secure enough hoops to prepare a full run of garments while one is on the machine for increased efficiency and throughput. Hooping Aids: These can be inexpensive ruler-like devices that mark the center of your design on any sized garment or costly jigs with registration systems over which you slide garments for straight and repeatable positioning you can record. Small shops sometimes balk at the cost as you can hoop manu- ally, but aids reduce errors and make hooping more efficient, especially for those new to embroidery and have a hard time judging alignment manually. 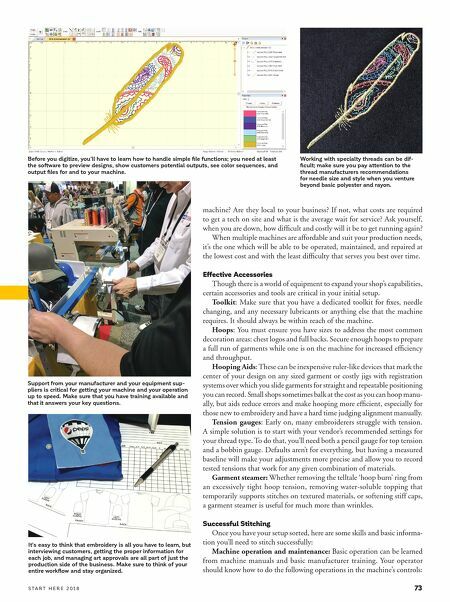 Tension gauges: Early on, many embroiderers struggle with tension. A simple solution is to start with your vendor's recommended settings for your thread type. To do that, you'll need both a pencil gauge for top tension and a bobbin gauge. Defaults aren't for everything, but having a measured baseline will make your adjustments more precise and allow you to record tested tensions that work for any given combination of materials. Garment steamer: Whether removing the telltale 'hoop burn' ring from an excessively tight hoop tension, removing water-soluble topping that temporarily supports stitches on textured materials, or softening stiff caps, a garment steamer is useful for much more than wrinkles. Successful Stitching Once you have your setup sorted, here are some skills and basic informa- tion you'll need to stitch successfully: Machine operation and maintenance: Basic operation can be learned from machine manuals and basic manufacturer training. Your operator should know how to do the following operations in the machine's controls: Before you digitize, you'll have to learn how to handle simple file functions; you need at least the software to preview designs, show customers potential outputs, see color sequences, and output files for and to your machine. Working with specialty threads can be dif- ficult; make sure you pay attention to the thread manufacturers recommendations for needle size and style when you venture beyond basic polyester and rayon. Support from your manufacturer and your equipment sup- pliers is critical for getting your machine and your operation up to speed. Make sure that you have training available and that it answers your key questions. 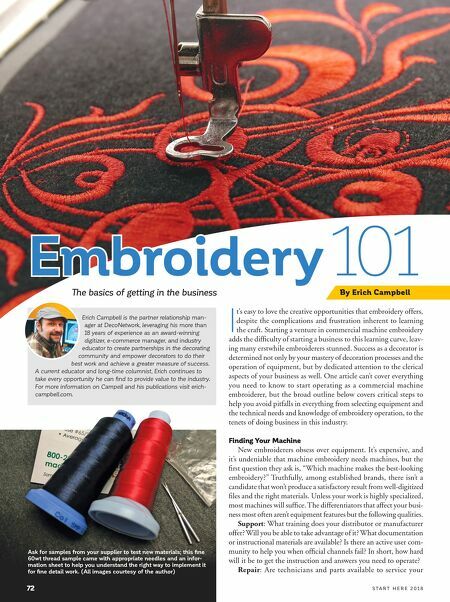 It's easy to think that embroidery is all you have to learn, but interviewing customers, getting the proper information for each job, and managing art approvals are all part of just the production side of the business. Make sure to think of your entire workflow and stay organized.